One of the most important factors to consider when adding a high tunnel or managing an existing one is irrigation. It might not seem obvious, especially when you live in a moist and humid climate with plenty of annual rainfall, but the growing conditions created within an enclosed plastic or glass greenhouse structure are essentially the same as an irrigated desert – sunny, hot and dry with only a controlled source of water. The simplest and most economical solution is to use a watering can or hose with a hand-held sprinkler attachment to water manually, and while this option may work well within a small high tunnel or even during an emergency situation, this method is quite cumbersome, time-consuming and sometimes challenging to gauge if and when you have watered sufficiently. How do you know if you have watered enough? The general rule of thumb is one inch per week during the growing season, whether it is supplied by actual rainfall or irrigation. And there is a common old-timer’s expression in New England that asks, “Did the moisture meet?” In other words, did the moisture that was applied go deep enough into the soil to meet the lower layer where the soil still holds moisture? If the answer is no, then it is typically more effective and much more efficient to supply water through various irrigation options. Some of the most popular and common approaches include overhead sprinkler irrigation systems and surface drip irrigation systems, both for their ease of installation, dependability, automation, and efficient water use. Combining the two options together in one high tunnel can also be an effective solution for many growers, especially if following four-season methods and growing crops year round. The simplest and lowest cost solution is a portable hose and sprinkler head system but it does involve more monitoring and manual repositioning of the sprinkler head in order to provide even coverage and avoid overwatering. The various options are described in more detail below. A ten-foot by twelve-foot plot or 120 square feet is about as large an area most people would want to water by hand so since most high tunnels cover a much larger area square footage, the simplest and most economical option for watering is to have some type of portable sprinkler system available. The key component is a good quality commercial sprinkler head – the Wobbler head for instance is manufactured by Netafim and it delivers water in large drops rather than a fine spray to ensure better coverage. The Wobbler can be mounted on commercially available stands or you can make your own with whatever length of ½-inch threaded pipe. The other end is screwed into a stable base and it is fitted with a quick connect garden hose coupler to easily receive a hose attachment. Multiple bases with Wobbler heads can be attached together every 20-feet or so to provide even coverage over the length of a 100-foot long high tunnel. Surface drip irrigation is a popular and very efficient method for irrigating crops in the high tunnel by delivering a uniform, precise and timely application of water. The method involves constructing a network of drip irrigation tape which is placed on the surface of the soil and down a row along the base of the plants in order to deliver steady drops of water directly to the root zone. Most drip tape is made from flexible polyethylene plastic tubing and has small drip emitters spaced evenly every 8 to 12 inches. You can customize the system to be as small or as large as you need, and also to the specific needs of the crops you are growing. Single row crops with longer maturity times such as tomatoes, cucumbers, peppers, eggplant, summer squash, etc. perform exceptionally well with drip irrigation. The flavor of tomatoes in particular, can be sweetened and intensified if the overall quantity of water is restricted and reduced. Two problems such as foliar disease and the splitting of fruit, which are commonly seen from overhead watering, are typically reduced from the practice of drip irrigation. Installing a drip system can be very straight forward since a simple set up only requires a spigot, a filter and a hose to provide the water and the set up requires only minimal water pressure to operate. An automated timer can also be added so that you can set the system to turn on once or twice a day. Since drip tape allows better control over the amount of water being applied, the crops are healthier and less water is wasted. Drip irrigation is often used with plastic mulch for transplanted crops to conserve moisture and create a more consistent moisture level in the soil. Another advantage is the option to add natural fertilizers such as fish and seaweed emulsions to the water before being applied. This method is called fertigation and is an effective means of adding nutrients directly to the root zone of the crops throughout the growing season. More information on drip tape irrigation such as how to set up your specific system as well as all the necessary supplies and materials can be found at one popular supplier, DripWorks.com. 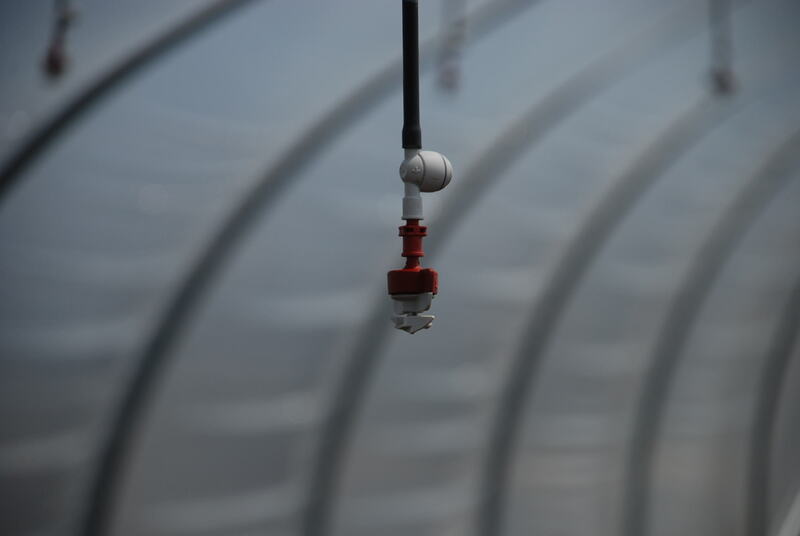 An overhead irrigation system is a plastic water piping network suspended from the framework of the high tunnel, and it consists of very small, lightweight spray emitting nozzles that hang down every 3 to 6 feet from the plastic pipe (see above photo). With such a system you can hook a hose to one end of the pipe and water the whole high tunnel from above. It is popular when growing leafy greens and other tightly spaced crops where the drip tape positioned on the surface of the beds would inhibit dense plantings. Most supplies and parts can be sourced from your local hardware stores and irrigation specialists. In the unheated four-season high tunnel, overhead systems are more reliable and easier to use than drip systems since the water in drip tape can freeze causing the tape to split and blocking the flow of water. To prevent the overhead pipes from freezing and splitting, it is important to set up the overhead sprinkler system with valves at both ends in order to empty out the water from the pipes after each irrigation session. With many high tunnels being used year-round for four-season production, it can be very useful to have both a surface drip system available for summer use to irrigate tomatoes for example and an overhead system available for late fall/early spring use when it can still be necessary to irrigate newly germinating crops and cold-hardy greens such as spinach. In the Northeast, the need to irrigate during the winter months may happen infrequently since the winter sun is low in the sky, the water table is higher and there is very little evaporation from the soil. But you do not want to become too complacent and ignore irrigating all together since a series of sunny winter days with air temperatures above freezing can heat up and dry out a high tunnel much more than you might think. A rainwater catchment system, which collects the rainwater off of the high tunnel into a storage tank, is an innovative solution to reuse naturally occurring rainfall. The expanse of a high tunnel yields a large volume of water with every measurable rainfall. Approximately 900 gallons of water will flow from the roof of a 30′ by 96′ high tunnel with a half-inch rain event. The water collected from the high tunnel from runoff should only be used for irrigation through a drip system since the water collected could contain high levels of bacteria. Many resources are available online for more information. Whichever irrigation option you choose, a reliable and functional system is essential for managing proper moisture for crop health, and can be an enormous benefit to the continued success of your high tunnel.